Lane-keeping assist perfectly centers vehicle in middle of lane. 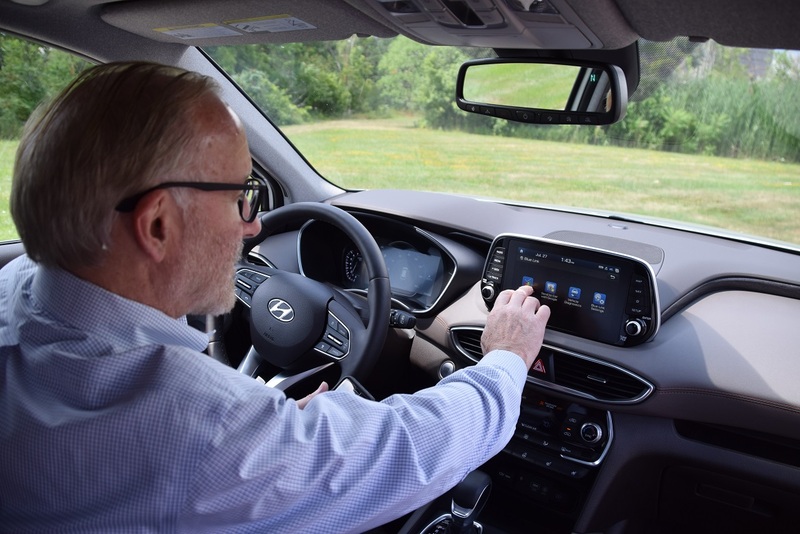 Hyundai is touting the rugged good looks of its new ’19 Santa Fe, but its focus on advanced driver-assist systems and the overall user-experience is what really makes it stand out. With a sticker of $36,555 including a $980 dealer delivery charge, our top-of-the-line Ultimate model comes with a full set of standard ADAS and infotainment features, big display screens, connectivity and state-of-the art UX design. Like few other affordable vehicles we tested this year, editors had something nice to say about almost every inch of the Santa Fe. Up front is one of the best head-up displays we looked at this year and in back is a power hand’s-free liftgate that opens when it senses your key and eliminates awkward foot wagging. In between is an interior layout that gushes with great UX design. Big volume and climate-control knobs and large buttons are slightly angled to the driver, and all displays are arranged according to cognitive workload. Information the driver must see frequently is placed in front, at eye level, in the HUD and central instrument cluster. Less critical infotainment functions are in the center stack display, again at eye level. Some may complain about screens located high on the center stack, but that’s where they need to be to minimize distraction. Standard ADAS features include forward collision-avoidance assist with pedestrian detection, blindspot collision avoidance, lane-keeping assist, rear cross-traffic collision avoidance, high-beam assist, smart cruise control with stop-and-go and driver attention warning. We tested the LKA and ACC on a 250-mile (402 km) road trip. The LKA kept the vehicle centered in the lane and combined with the ACC we were spoon fed tasty 30-second bits of autonomy. Then there is wireless device charging, a surround-view monitor that works better than most and a new safe exit feature that prevents occupants from opening a door in front of a bicycle or motorcycle. A rear-occupant alert is optional. The on-board navigation system works well and has excellent graphics. Apple CarPlay and Android Auto both function well. Did we mention there are four USB ports and three 12V plugs for charging laptops and other devices? “I think this might be the best all-around UX vehicle for its combination of great ADAS, top-level HUD and intuitive controls, solid voice controls and good navigation. The ‘walk up’ activated power-opening liftgate puts it over the top,” sums up editor Bob Gritzinger. Interior layout gushes with great UX design. Big volume and climate-control knobs and large buttons slightly angled to driver, all displays arranged according to cognitive workload.